Plica syndrome, also known as synovial plica syndrome is a condition when a plica becomes irritated, enlarged or inflamed. 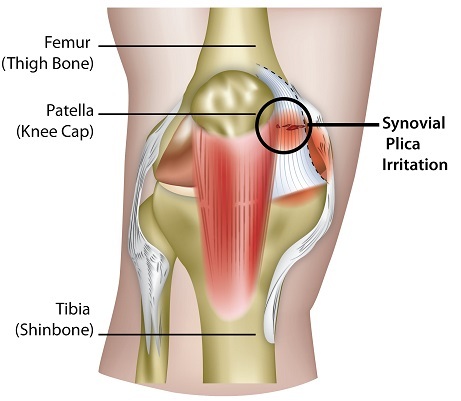 Plicae (plural for plica) are normal structures that are found in many knees and do not generally cause any problems. It appears to be like a membrane and is located between the synovium of the joint. There are 4 morphologies, named accordingly to their anatomical locations: suprapatellar, mediopatellar, infrapatellar and lateral plicae. A suprapatellar plica is found generally in the suprapatellar pouch and its occurrence ranges from 65-78% but the medial plicae are the most problematic. In another study, it was found that 87% of the population have suprapatellar plicae, 72% mediopatellar plicae, 86% infrapatellar plicae and 1.3% lateral plicae. Symptomatic plicae are usually present in active patients that have repetitive knee movements either in their jobs or hobbies. In specimens of symptomatic plicae, it was found that the plica has thickened, scarred and lost its elasticity. Females may have a higher chance of plica syndrome occurrence although it is more common in teenagers. History of injury, chronic overuse or inflammatory conditions is associated with the development of this disease. The main cause of plica syndrome is unclear. Its development is associated with an inflammatory process that occurred after trauma, overuse injury or meniscal (cartilage cushion in the joint that aids in absorbing shock) tears. The inflammation can lead to damaged tissue leading to fragile plicae. It may also be due to decreased elasticity in advanced ages. locking of the joint (inability of the joint to move beyond a certain angle). The pain may be intermittent or aggravated by physical activity (stair climbing, prolonged standing, squatting or sitting) and inability to bend the knee. The diagnosis of plica syndrome is made via patient history and physical examination. It may also require some imaging to rule out other diseases. The diagnosis is made by exclusion of clinical and radiological findings. Arthroscopy (a minimally invasive surgical procedure that enables the examination and sometimes treatment of a joint) is the standard for definitive diagnosis of plica syndrome. Conservative treatment is recommended. It includes physiotherapy to reduce inflammation, analgesics to reduce pain and inflammation, ice packs and hot packs if patients find it to be beneficial. Patients are also counseled to rest the affected knee with the limitation of certain activities. Up to 60% of patients have their symptoms resolved after a year of conservative therapy while the other 40% found no benefit and proceeded to surgery. Surgery is implicated in some cases when conservative therapy has failed for at least 6 months. 65% were found to be able to resume their sporting activities and the other 34% can expect to be at least pain-free. Surgery is inevitable for those with torn plicae. A longer duration between the symptom onset and surgical treatment is associated with cartilage damage. Patients should also be made to understand that therapeutic exercises begin shortly after surgery. Follow-up care of patients is important to confirm the resolution of symptoms. Recurrence of plica syndrome is rare and is more likely to represent a different condition. Many patients have also preferred to continue using a patellar stabilizing-type brace. A rehabilitation and quadriceps strengthening program can help facilitate a fast return to activities. Al-Hadithy N, Gikas P, Mahapatra AM, Dowd G. Review article: Plica syndrome of the knee. Journal of Orthopaedic Surgery. 2011; 19(3):354-358. Abrahams S, Kern JH. Anterior knee pain. Plica syndrome, the forgotten pathology? Physioterapy. 2001; 87(10):523-528. Dupont Synovial plicae of the knee. Controversies and review. Clinical Sports Medicine 1997; 16:87–122.